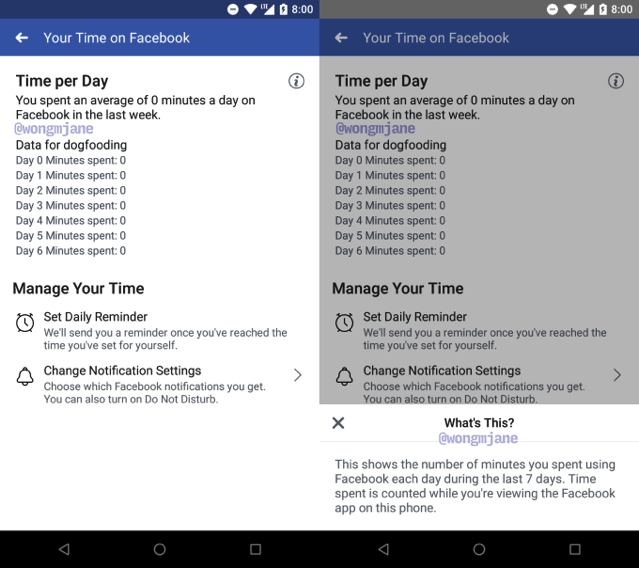 A new feature found hidden inside the Facebook Android app named ““Your Time on Facebook” shows the tally of how much time you spent on the Facebook app on your phone on each of the last seven days, TechCrunch is reporting. The feature also displays your average time spent per day, and can alert you when you’ve reached your self-imposed limit. A Facebook spokesperson, who confirmed the upcoming feature, said, “We’re always working on new ways to help make sure people’s time on Facebook is time well spent”. Facebook has already made changes to its News Feed algorithm designed to reduce the presence of low-quality but eye-catching viral videos. And this new feature could further help Facebook users stay mindful of how long they’re staring at the social network. CEO Mark Zuckerberg said on an earnings call that the updated News Feed algorithm has reduced time spent on Facebook by roughly 50 million hours every day.